It’s interesting. Because Twitter is opt-in, I don’t care *as* much about @reply spam right now as I do direct message spam. I’m ruthless about being blindly solicited for people’s mafias and the like. 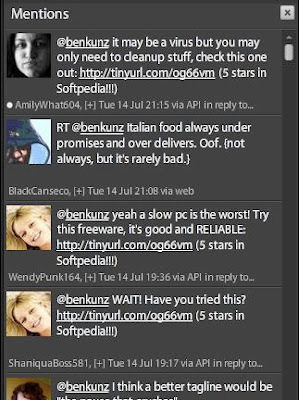 But you raise a good point: if the @reply pane suddenly becomes crushed with ads, we’ll all unplug. So while I support sponsored posts (and I still do), the problem you’re reporting is spam and not sponsored posts. I think you’ve leveled your gun at the wrong target. SPAM is bad. Sponsored posts done like spam are bad. Sponsored posts aren’t always done like spam. Does the future of sponsored posts HAVE to be one that promotes spam? Great question. That’s worth talking about. But to leap from “sponsored” to “spam” isn’t accurate. There are people spamming me every day for free. Non-sponsored. Take a look at my dumb whatever. Click my junk. Please read my stupid blog post. Every day. I counted one day while on vacation. 87 requests in DM and 14 in @ replies. So, I’m not so sold on your connection, but I love the conversation. Thanks, Chris. It is a natural evolution for marketers to buy their way into networks. I agree that sponsored posts are not as obtrusive as tidal waves of @hey spam, but I stand by my forecast that the rising tide of shills will eventually diminish the value of the network — as it did with phone and email — until the approach doesn’t really work. No of course, a reputable pundit who takes the Izea coin is a world away from, oh, I don’t know, let’s take @twitgoldmine007 as an example. But as Ben says, surely that’s the whole point. To take one example, sadly I see that one of Izea’s clients is Air New Zealand. And Air New Zealand does some truly awesome work. Unfortunately, having recently spotted a stack of Air New Zealand posts I’m no longer thinking of their great ‘naked’ campaign. Rather, I’m now wondering how much some of those endorsements cost them and which are real and which are fake.